I was one of those who noted Sony had some troubles, as manufacturers often do, with some of their first generation lenses for full-frame FE mount cameras. When they announced the G Master lens series I was really excited to test them. I was expecting Sony to have made progress both with optical quality and with copy-to-copy variation. I wasn’t sure that they’d be as good as the best lenses coming from the long-term photo manufacturers, but I did expect they would be close. In case you don’t like to read or look at charts, you can stop here. The 24-70 f/2.8 GM lens is as good as any 24-70 f/2.8 zoom from any manufacturer, at least as far as bench-test results go. 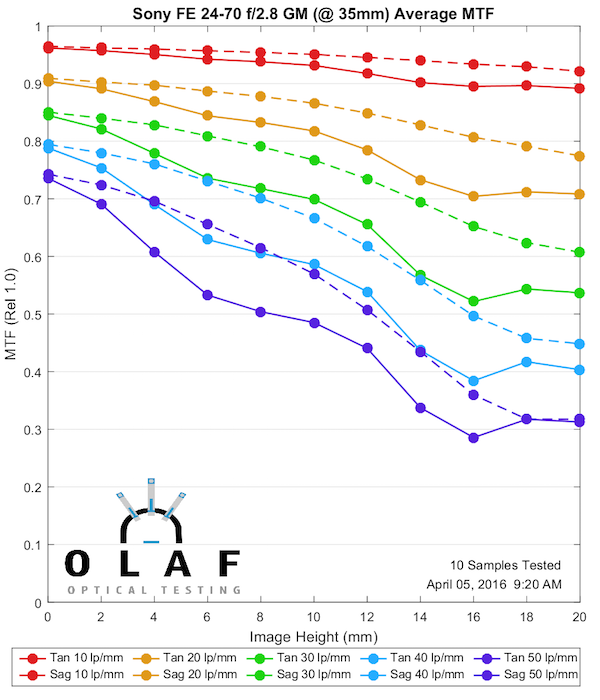 As I discussed in our post about the 70-200mm f/4 lenses, our testing algorithms and presentations are changing as we improve things and try to make them more scientific. If you missed that there are two major points. First, the variation algorithms are different, both to make the charts easier to see (we show a 1 Standard Deviation range, rather than the 1.5 S. D. we used to) and to eliminate the Consistency Number. We found that the Consistency Number was too blunt of a tool; it showed only one limited part of variation. There were cases when there were two lenses had the same consistency score, but one was quite a bit worse than the other in ways the number didn’t show. Finally, one note about this test. 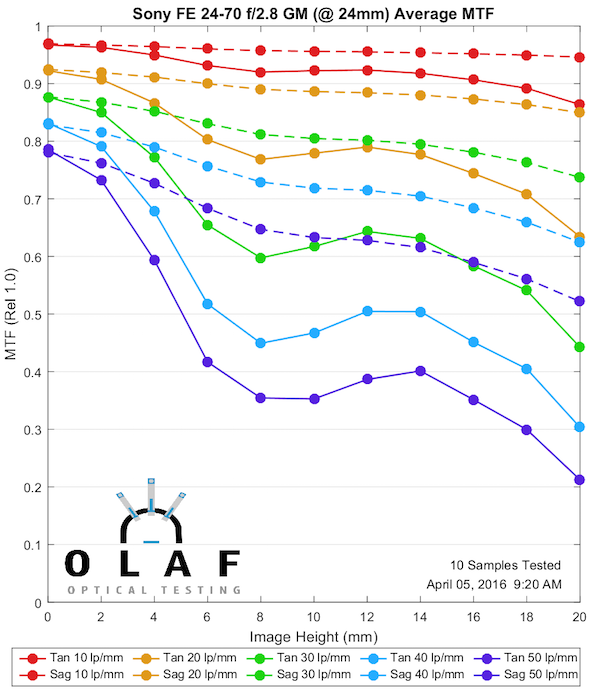 We found that the 24-70mm f/2.8 GM lens performed best with 2mm of optical glass placed in the pathway, simulating the cover glass of a camera sensor. This is of NO significance to persons shooting with the lens, but I mention it for completeness sake. 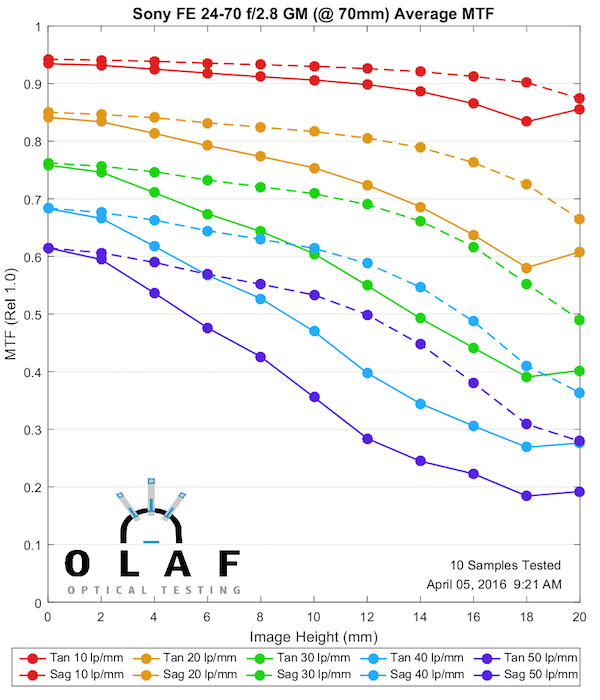 We check every lens we test with and without glass in the optical pathway and present the best MTF results. We tested 10 copies of the lens at 24mm, 35mm and 70mm focal lengths. I’ll print the results full size first because sometimes it’s hard to see the smaller comparison charts. These are really impressive MTF curves with excellent resolution, but it’s always helpful to compare things a bit, so below are side-by-side comparisons with the Canon 24-70mm f/2.8 Mk II and Nikon 24-70 f/2.8 AF-S VR lenses. First, we’ll compare the MTFs at 24mm. I know the graphs are a bit small (click them for larger), but it should still be apparent that the Sony is at least as good as the other two lenses. It actually has the best center resolution, particularly at higher frequencies, which backs up Sony’s statement that this lens was designed with high-resolution sensors in mind. 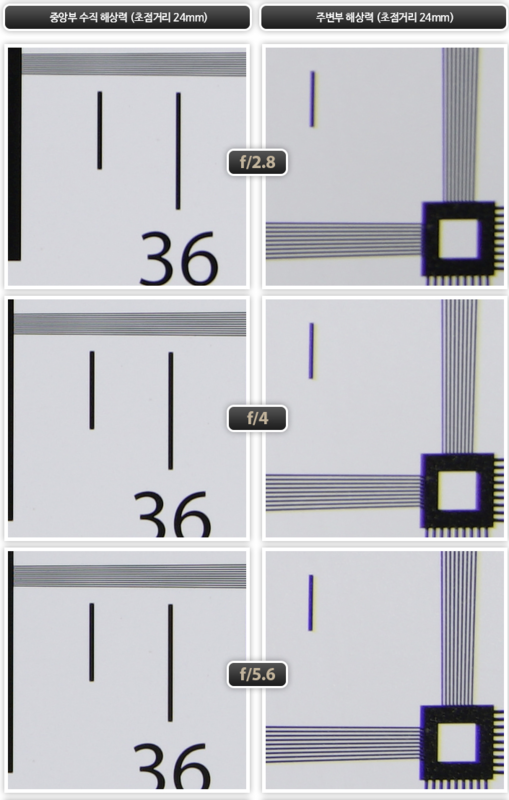 Off-axis, it maintains good sharpness to the edge of the field, although it does have a bit more astigmatism or lateral color (it’s not possible to differentiate the two on a single-aperture MTF test). All three of these are excellent lenses at 24mm. The Sony might be a hair better, but it’s a pretty minor hair. The 70mm end of 24-70mm zooms tends to be the weaker end, so we’ll do the same comparison there. None of these lenses are quite as strong at 70mm as they were at the wider portion of the zoom range. Again the Sony is at least as good as the others. It has, by a tiny hair the best center resolution, and while it isn’t quite as flat across the image as the Nikon, it is better in that regard than the Canon. It does have just a bit more astigmatism / lateral color on the MTF bench, though. Fanboys can split hairs about which lens is best if they need to, but really all three of these are excellent lenses with only minor differences between them. This was the part of testing that I was most interested in since we’ve seen a few Sony FE lenses that had pretty large copy-to-copy variation. I’ll remind you again that the variance algorithms are different now, so for comparison, I’ve redone the variance graphs using the raw data from the Canon and Nikon 24-70 lenses, too. Both of them we consider pretty good, with a reasonable amount of variation for zoom lenses. To my surprise and pleasure, the variation of the Sony G Master lenses at 24mm is at least as low as, and perhaps a bit better than, the Canon and Nikon zooms, both of which we consider good for zooms. We knew that both the Canon and Nikon lenses had more variation at 70mm than at 24mm, so we expected the Sony would, too. Like the Canon and Nikon, the Sony did have more variation at 70mm. But the Sony doesn’t worsen more than the others, they all end up fairly similar. 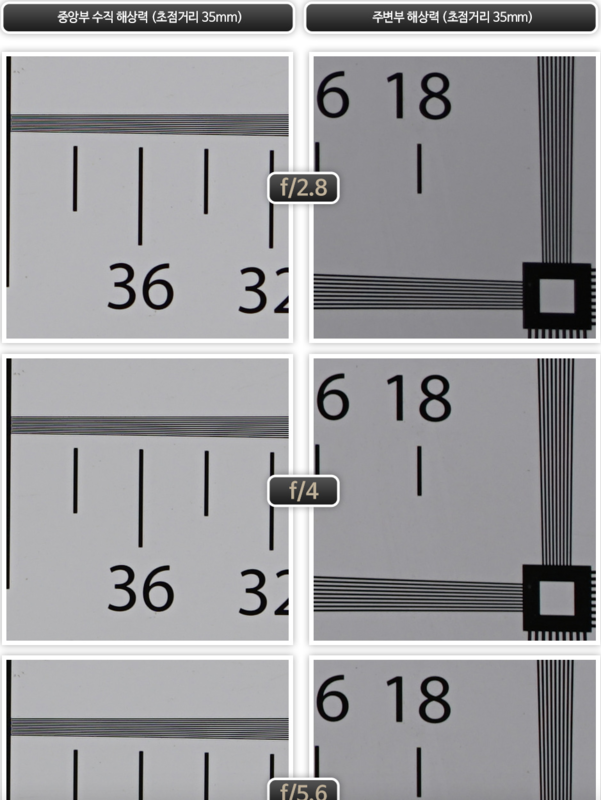 As an aside, we also checked variance in the middle of the zoom range and the Sony was really quite good there. In other words, if your copy has problems, it will almost certainly be at 70mm, but if you buy a Sony 24-70mm f/2.8 you are no more likely to have an issue than you would with a Canon or Nikon. When the Canon 24-70 f/2.8 Mk II came out a couple of years ago, I hailed it as dramatically better than what had ever been available in this range. Sony FE shooters now have it’s equal in a native-mount lens. Sure the fanboys can split hairs about this or that, but the differences in the lenses themselves are tiny. 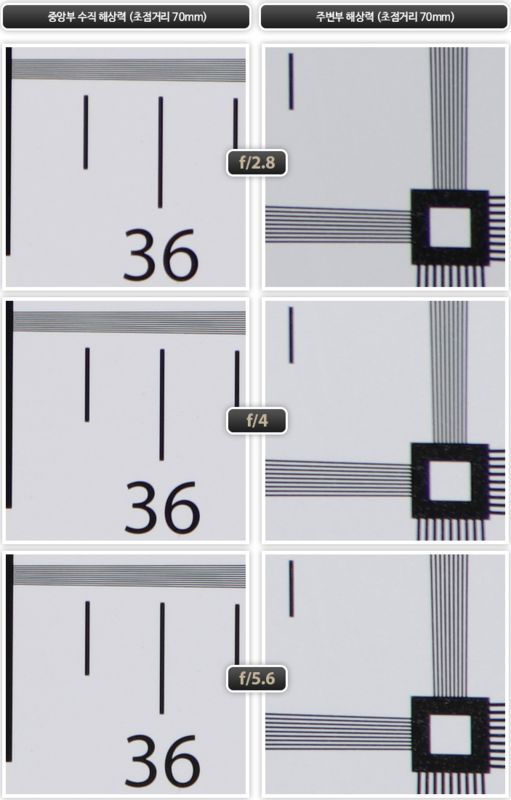 Of course, the proof is in the image, but early reports from reviewers seem to agree the new Sony performs just as well in the field as it does on the MTF bench. Well done, Sony! Mich interessieren diese ganzen Testcharts nicht mehr! Leider wird so viel gelogen! What lens is the first one? Is it the Sony or Canon? Thanks. These are for 16-35mm F2.8 GM. You can see the sharpness compare to 24-70 GM. Even Dxo put lower score on Sony 24-70mm F2.8 than Canon 24-70mm F2.8 ii. Photozone also indicate that it has poor sharpness at edges. I really doubt about this testing for Sony 24-70mm F2.8 GM since other GM lenses have the greatest sharpness. Sony Gm 24-70 has less sharpness compare to Canon 24-70 ii. I have no idea why people kept speaking that Sony GM 24-70 has the greatest sharpness while the real life test showed that the edge sharpness is soft. Roger, why you didn’t test this lens at 50 mm, as you do with other lenses 24-70? Wanted to check in to see if Brandon ever did the tests on the 24-70 f/4 to compare with the G. Am considering the G but it is a very pricey lens so am interested if it will replace 3-4 primes or better my f/4 by a significant margin. Owner reviews on forums indicate a lot of per copy variation, but when you get a good one it is worth the entry price. Not really impressive for 2200 dollars lens. 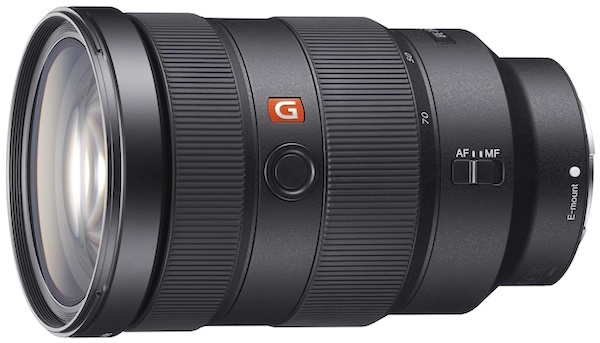 I really hope as soon as possible lens from tamron/sigma/tokina at half and less prices. Meh I’ll do it when I go down to train the intern. Trial by fire, as they say. Shaun, I would if we could get MTFs on the f/4. We’ve tried. Lord knows we’ve tried. But it’s the only lens we’ve ever tested that distortion varies. Which means each copy has to be done by hand. We just haven’t found that kind of time. The original FE 24-70 f/4 is a workable lens, not spectacular, but not a dog either. I wonder if you can post the MTF for the FE and new G lens next to each other for comparison, to see what the extra $1100 buys. JJ, we didn’t notice anything like that – in fact the lenses all seemed to seal very well – you could feel the rubber resistance when mounting. But I couldn’t tell you if yours is the lens or the camera side of the mount. Roger I just received my 24-70GM today. When mounted on my A7RII I noticed that the ‘rubber’ seal on the lens mounting flange does not make a complete seal against the camera body flange. There are 3 very distinct areas where i can see a sliver of light between the lens gasket / seal and the body. These slivers of light reach well to the inside of where the gasket is. Is there any way you might be able to check a few combos of your 24-70 GM / A7RII to see if this shows up? It appears that the ‘seal’ on the lens side is either pushed to far into the lens to make a proper seal or that the face of the seal is not uniformly parallel to the e-mount flange. You guys are the only ones I know of who have multiple copies of the 24-70GM… FWIW the largest ‘gap’ I see with the lens mounted is on the top center of the flange in landscape orientation. Of course that is the worst possible area to possibly have water intrusion. Any input you have would be appreciated. Marc, I was an Anesthesiologist. I did Trauma Critical Care when I was young and thought 24 hour shifts would be a great lifestyle, but got over that after a few years. Roger, what is/was your medical specialty? My wife is a radiologist and I taught anatomy to med students. Mike, thanks for your comments. I definitely use field tests to figure out which lenses I’m going to use. This was more curiosity on my part because I’ve seen CA decrease the acuity of my images, so I was wondering how this was reflected in the MTF curves. There are a lot of things that degrade performance that you can’t see in a single chart. 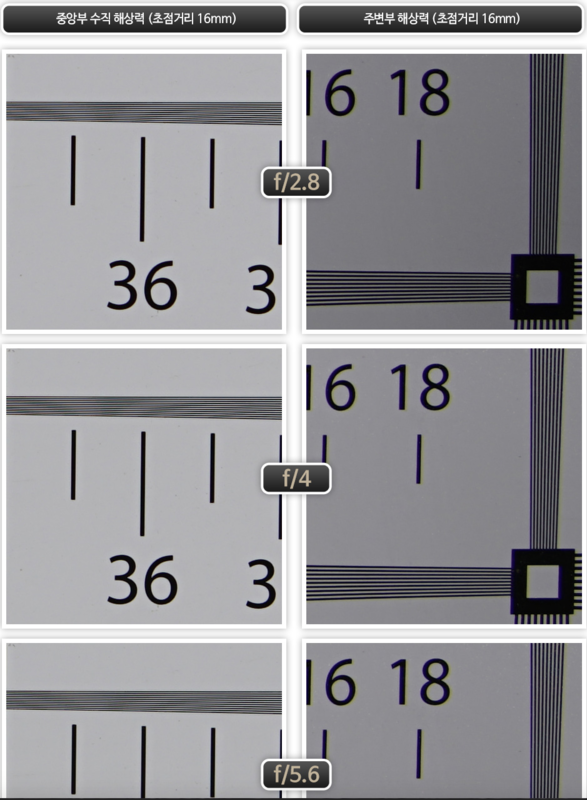 You would need multiple charts for different focusing distances, for example. You could also have different focusing charts for different color wavelengths–green tends to be the sharpest usually. the variables are, well, extensive. Yeah, but as Master pointed out this Sony faces much stiffer competition on launch than that Canon did (and Sony does not have nearly the stability of market share and position that Canon does). It’s a little better, a minor difference is still a difference, and bokeh is not yet compared. Say what you will but the Sony’s price, unlike the Canon, has plenty of room to fall and it will be even more attractive to buyers. If Canon doesn’t speed up its body improvements, this lens and fast improving Sony bodies will attract more and more converters. Hi Roger, the past articles are without comments now — are the (pre-Disqus) comments archived or have they been lost in the migration? Thanks Brandon: no worries. That’s still useful information! It’s really sad to see such a high quality blog with such high quality content marred by such negative boorish trolling. I certainly wouldn’t complain if there were a few obvious bans. Psst. Thanks for the info, but don’t tell that to any Nikon users. You know that F-mount is even narrower than the E-mount. Users would feel bad if they learned that F-mount is totally unoptimized for FF-lenses.